There are times when due to lack of attention, blind spots we cannot see in traffic, such as the space between two parked cars, or a sudden change in the traffic around us, that an accident is almost unavoidable. Nissan has been working hard to develop a system that exploits that “almost” clause. 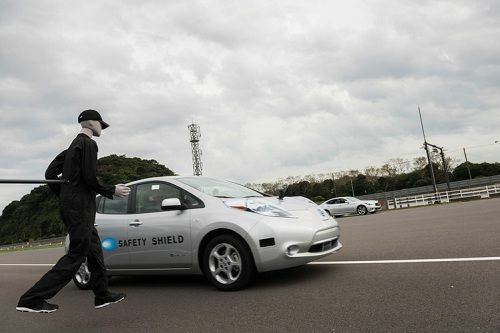 Dubbed Autonomous Emergency Steering System (AESS), the system has been in development for quite a while and was recently demonstrated at the Nissan Advanced Technology Briefing earlier in the month. In a press release today Nissan has provided a video explaining some of the system’s attributes and capabilities. Carrie Underwood’s hit single provides us with the premise; “She had a lot on her mind and she didn't pay attention She was going way too fast…Before she knew it she was spinning I'm letting go. So give me one more chance To save me from this road I'm on Jesus, take the wheel.” Ms. Underwood is of course using the driving theme as an analogy, but the truth is very similar. There are times that “didn’t pay attention” can result in serious damage. Here it is Nissan taking the wheel. The AESS system from Nissan excels at looking ahead with sensors to determine if a closing speed can be dealt with by only brakes, or if steering input is the only solution to accident avoidance. If it determines steering must be done, and the driver does not do it, the system does it for the driver. The video example Nissan provides is a simple overview, but this does beg the question, what if the Nissan system did take the wheel, steered to avoid a rear-ending collision and then steered into the path of an oncoming tractor trailer? Perhaps this automated system will be perfect, or close. The truth is that most of the time, a semi won’t be coming and the system could save damage or lives. One accident that it does seem to be adept at helping drivers to avoid is the pedestrian stepping out from (or falling out from) between two cars. NHTSA statistics include quite a few drunk walker accidents that occur each year, and drivers, although not technically at fault, do not want to be involved with that mess. Public service announcements showing a text-walking teen making that same mistake are now running on television. Behind a rolling ball comes a running child is another truism. Sometimes there is no ball to warn us. In the video it is clear that the system might well augment even the best driver’s reaction ability. As you consider if you think the system is good or bad, change your perspective and ask if you would want the driver texting her BFF behind you to have this system or not.